Talk of an upcoming press conference flooded the office like a tsunami. Listening intently on conversations and conference calls, while sifting through various e-mails was truly the only way I could keep up. I had never been to a press conference let alone planned one. The month leading up to the press conference, everyone was working on a very strict timeline. Who knew that a press release shouldn’t be released too early or too late? Or that social media should blast all at once to create the highest exposure? I didn’t, but as the weeks counted down things were falling into place. By the time I walked through the doors of the FAIR school the day of the press conference, we had plenty of PR artillery and were ready for action. My main priority leading up to the press conference was to keep a running guest list of some of the most highly recognized and influential people in our state. The governor’s office, congressional delegates, admirals, generals, superintendents, veteran organization leaders, media teams and Fortune 500 corporate leaders just to name a few (and let’s not forget the most important attendee, Medal of Honor recipient Tom Kelley). As the RSVP’s came in, I was amazed at the amount of people that wanted to show their support by attending. Before then, I had no idea people actually attended press conferences; I thought they only aired on TV. Details swirled in my mind while I scrambled around the theatre room in the hour before the press conference. Keeping track of everything was exhausting; from acknowledging important persons and news stations to making sure everyone had name-tags and copies of the run-of-show, I was surviving on pure adrenaline. My lack of extensive military knowledge showed again when we had an issue with the flags. I hadn’t known flags couldn’t touch the ground! The audience took their seats and the speakers walked up on stage. There was nothing left to do besides watch as a month of planning (with plenty of blood, sweat and tears) culminated right in front of me. News cameras pointed at the impressive stage and the room became silent. Everyone was there for his or her own reason that day, but left feeling the same way: inspired. I was told an average press conference is informational and the speakers stoic. The storytelling of this press conference was so passionate and personal that it was clear to see that the people donating their time and resources to this convention have a special place in their hearts dedicated to those who have defended our freedom. I can now say I have some knowledge about how a press conference is run, but the biggest thing I left that day with was gratefulness. I am grateful to be part of a non-profit, but what is so fulfilling is that this particular non-profit thrives off of passion for those who serve our country. 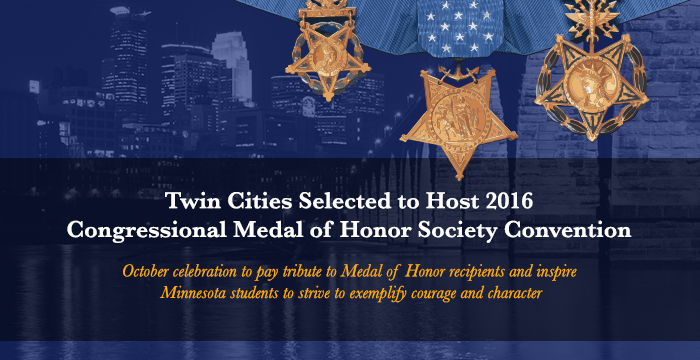 MINNEAPOLIS (Feb. 17, 2016) – The Congressional Medal of Honor Society (CMOHS) has selected Minneapolis-St. Paul as the host community for the 2016 Medal of Honor Convention, taking place October 4-8, 2016. The Medal of Honor Convention is a distinguished annual gathering of Medal of Honor recipients. Recipients have been recognized for their heroism with our nation’s highest award for military valor. The convention will offer a wide range of events including several meaningful opportunities for the Twin Cities community to interact with and honor the recipients. Highlights of the week will include the official public welcome, autograph session, school visits and the black-tie Patriot Awards Gala. The Medal of Honor Convention Twin Cities is made possible by generous support from more than 30 national and Minnesota-based companies, organizations and individuals. UnitedHealthcare, a Minnesota-based company that serves nearly three million military service members, veterans and their families through the Department of Defense’s TRICARE program, is the convention’s Presenting Sponsor. Target is the convention’s Hero sponsor. Other major sponsors include American Airlines, APi Group, CHS, Delta Air Lines, Medtronic, Mortenson, St. Jude Medical, U.S. Bank, Ecolab, Hubbard Broadcasting, Liberty Diversified International and Sit Investment Associates. The Medal of Honor is bestowed by the President, in the name of Congress, upon members of the United States Armed Forces who distinguish themselves through “conspicuous gallantry and intrepidity at the risk of his or her life above and beyond the call of duty while engaged in an action against the enemy of the United States.” The Medal of Honor is the nation’s highest and rarest military decoration. Since 1861, when the Medal of Honor was created by President Abraham Lincoln, 3,496 individuals have received the medal. There are currently 77 living recipients. To further the bond of brotherhood and camaraderie among all living recipients of the Medal of Honor. To remember in reverence and respect those who received the Medal of Honor posthumously, and those who are now deceased. To foster patriotism and to inspire and stimulate our youth to become better citizens of our country. To recognize and award patriotic Americans who promote and perpetuate the principles upon which our nation was founded through their life’s work. I open the door to the FAIR school and the first person I see is Tom Kelley. My nerves collide with tremendous excitement as I realize I actually get to meet a Medal of Honor recipient. I catch the eyes of the Chairwoman and she begins to walk Tom Kelley over to me. I can’t help but focus solely on him; everything around me goes into a blur. I feel that a handshake does not suffice for my overwhelming emotions, so I lay my other hand on top of his in hopes that it will convey the utter honor I feel meeting him. His creased smile and warm hands comfort me and put me at ease. I have seen videos and read stories about him, but to finally meet him in person makes it all so real. In that split second, a scene of Tom flashes across my mind. He’s reaching, not for my hand to shake, but for his brother. Whether it is grabbing the helm to maneuver himself between his men and enemy fire, shaking the hands of his sailors after a long mission at sea or folding them in humble prayer for our country, I know those hands have done incredible and unexplainable things. Hands that shaped history are now shaking my own. An hour goes by and, as I’m wandering around the building tying up loose ends before the press conference starts, I walk past a room with a handful of middle school students leaning forward in their chairs and Tom Kelley standing in front of them. I peek my head around the doorframe and find a little window between two of the news station cameras to watch the interaction. All eyes are locked on Tom as he tells first-hand accounts of bravery and sacrifice that, prior to this, the students have only read about. In that moment I feel chills run down my body. A history book character is literally standing right in front of these students, telling stories and answering their questions. Compelling is too small a word to describe what it is like to watch the younger generation find fascination in the Medal of Honor. Before I had the opportunity to meet Tom Kelley I heard from multiple people, multiple times, that the recipients are incredibly humble and do not believe they did anything that any one of their teammates would not have done in the same circumstance. To the recipients, the Medal of Honor is not an award; it is a responsibility. It is not something that they wear for themselves or because they even think they deserve it. The recipients wear their Medals as a way to honor their teammates, fallen servicemen and women, and thousands of other military members who have served our country and have not been recognized for their heroic actions. “We are just ordinary people put into extraordinary circumstances who decided to do the right thing,” said Tom Kelley, in between bites of his plain hamburger. Sitting across the table from him at a hole in the wall diner, having regular conversation, I couldn’t rest my smile. It was in that moment that I truly believed that I was, as an ordinary person, capable of extraordinary things. He and his fellow recipients truly are the definition of humble heroes. The MOHTC team at the press conference in February. Two weeks in and I was still impacted by the Medal of Honor recipient’s stories. I had begun to understand my place in this new position. My work days were getting busier and I began to meet more people involved with the Medal of Honor Convention Twin Cities. The big red curtain started to pull back as I saw the people involved behind the scenes of this enormous project. Sitting in the office one day, I felt a lightness in the air I was breathing. The facial expressions and tones of voice from the Chairwoman and Chief of Staff, the two women I spend most of my working hours with, sitting across from me radiated with passion as they began to fill my head with more knowledge. Smiles swept across their faces as they exchanged military lingo and recited the six characteristics of Medal of Honor recipients. I giggled under my breath as I realized this was truly FUN for them. They were certainly entertaining themselves. Courage. Commitment. Sacrifice. Patriotism. Integrity. Citizenship. Staring at the white board and seeing these words written in bold, I began to repeat them over and over again, as if each time I whispered them they were becoming closer and closer to being engraved in my mind. We brainstormed all day on ways to implement these words into schools across the state. After hours of hard work, my scope of knowledge of the Medal of Honor widened even more. I would’ve never guessed there could be a connection between the war heroes and children, but as the pieces fell together I felt that light air again, this time coming from me. Just like that, I saw the ultimate goal in these women’s hearts. To them (and now to me), it isn’t just about the Medal of Honor Convention, it’s about educating and inspiring our community for years to come. I walked out the door that day with a skip in my step and newfound passion gushing from my heart. I realized that while I was suddenly feeling enlightened, I was also troubled by the simple question: Why? We spend a good 13 years learning about our country’s history, but where are these most incredible stories of sacrifice and courage? Why aren’t we taught about our nations greatest heroes? Why aren’t more people aware that there are 77 LIVING recipients that we can still learn from firsthand? Why don’t more people know? My name is Kassie and I am your typical 22-year-old woman. I grew up in Minnesota, attended college here, got a four-year degree and set out to find my dream job, like every other recent college grad I know. With an Event Management degree in hand and four years of non-profit experience I was ready to tackle the dreaded fresh-out-of-college job search, what I hoped would be the first step to fulfilling my dreams. Unfortunately, after three months my fingers were curled to the keyboard and stiff from the carousel of job applications; my opportunites seemed to narrow considerably with each passing day. A brisk day in November had me in a mix of emotions when I came across a posting for an assistant to a Chairwoman of a new non-profit organization. She scheduled an interview with me immediately and, after much conversation, she advised me to check out her organization. “Medal of Honor Convention Twin Cities.” Once I got past the vast title I began to do some researching. The website radiated with patriotism, which, to someone who knows little about our armed forces, was both enticing and intimidating. I sifted through tabs on the site and came to the simple conclusion that this non-profit must have something to do with an event for people in the military. My first day on the job Chairwoman and I were walking through a grocery store when she asked my opinion of the military. In my head I began to think, What does that even mean? Am I supposed to have an opinion? No one has ever asked me this before, and my favorite, Who is even included in the “military?” That last question makes me laugh now but I really had no idea what that broad term meant. I had a feeling that my new boss was catching on to my naïveté when she handed me a stack of six DVD’s about the Medal of Honor. I sat down with my computer, stared at the screen and, within fifteen minutes, I was sucked right in…Let me tell you why. As a born romantic, I have always loved military and war-centric Hollywood movies (Saving Private Ryan being my personal favorite). To me, without much, if any, direct contact with servicemen and women, the movies were exciting and the sub-plots always captured my heart. However, while I sat watching DVD after DVD of raw footage of men who have gone above and beyond the call of duty and risked their lives for our country, I became overwhelmed with emotion. For the first time in my life I felt a connection to the military, and I was intrigued. Starting to grasp the idea of the Medal of Honor and who the recipients are, I still barely understood what the non-profit organization was about. Passion arose within me for this enormous project even without full knowledge of the Medal of Honor Convention. Day after day I would arrive to work with new questions. With basic knowledge of non-profits working with the military I never thought my talents would fit in, but I began to realize my event management major could come in handy. Watching the two worlds collide, I hit the ground running. I encourage you to take a look at this website, even if just to get a laugh imagining me perusing around with an ignorant mind. Click around and see if you find yourself in the same place I did: confused, but oh-so fascinated.